Over the Christmas holidays I restored a SEL Lo2000 teletype from 1978. The device was sitting in the attic for around 25 years and was in a pretty bad shape. The mechanics of the printer was worn out, leading to colliding and bent types, the electronics were non-functional (broken inductor in clock signal path) and the punch for the punched paper tape was not working (dried out lubricants, misaligned mechanical parts, …). After putting everything back together I wanted to use the device. But… the network for it has been switched off in the year 2007. Luckily, there is an alternative to it called “i-telex”. The project provides hardware for interfacing the teletypes and software for creating a virtual teletype network over the internet. Very nice. However, by the time the hardware would have arrived my Christmas holidays will be long over. So I had to find a quicker and simpler way. And this is what this post is about. The early teletypes used a current loop to signal the data. In this TW39 standard, the line provided 40mA for a ‘1’ and 0mA for a ‘0’. The teletype could use this current to actuate an electromagnet for reception or interrupt the current in a certain pattern for transmission. So this standard was quite a good fit for the early mechanical teletypes. However, the standard was sub-optimal for the communication network. For one, it required two lines (current in & current out). In addition to that, the communication also requires DC-coupling. These two facts mean that you are always tied to a special teletype network that is completely separate from the telephone network. You cannot use this signaling over telephone lines. To overcome the problems of the TW39 standard, Siemens introduced the ED1000 standard (which is quite similar to V.21). In this standard, a ‘1’ is represented by a 700Hz sine wave and a ‘0’ by a 500Hz sine wave (from network->teletype). This signaling removes all the disadvantages of the TW39 standard and also allows to use full-duplex (since the teletype->network signaling uses different frequencies). The connection to the teletype can be made via a simple adapter cable from 3.5mm to the connector of the teletype (in my case Ado8 pins 1 and 4. Pins 5 and 6 need to be bridged as well). Remember to turn the volume all the way up to have the maximum signal swing at the output. So far the script can only transmit data. It would be also nice being able to receive data from the teletype over the microphone input of a sound card. With that functionality the final goal would be to connect with the script to the i-telex network to realize a fully working teletype. 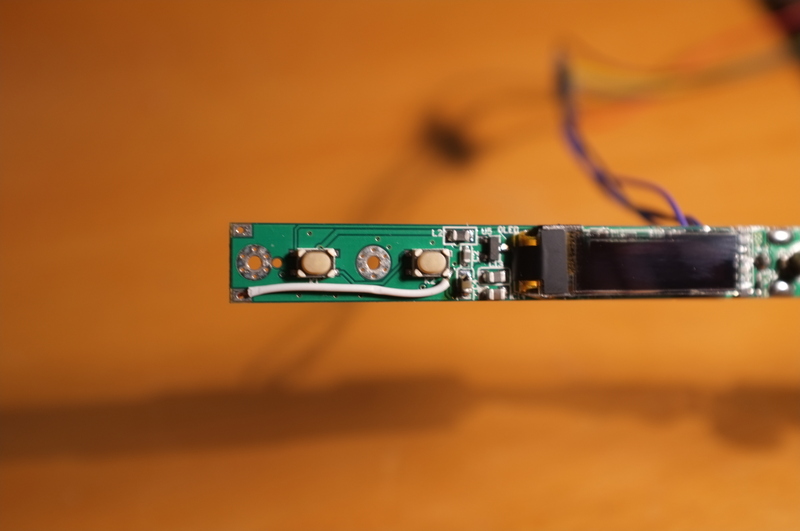 This post describes a Smartpen with a 128×64 RGB POV display embedded into the pen’s clip. Sometimes while sitting in a meeting, I see some people staring for 30s or more onto their watch. To me this always looks a bit like a first grader that is learning how to read the clock. So you can guess by now that I am not a big fan of Smartwatches. But still, the ability to check for messages without looking at your Smartphone seems to be desirable, especially while sitting in a meeting. This motivated me to think of alternatives to the Smartwatch. Of course, it should be an everyday object that is improved by some “smartness”. Thinking again of the meeting situation, the only other typical object I could think of would be a pen. Of course, the surface of a pen is a bit too small to add a high resolution display to it. And in addition, this would be quite boring. Therefore, I wanted to add a high resolution POV display by embedding a line of LEDs into the clip of the pen. Sometimes, I just wiggle normal pens between my fingers. With the addition of the LED line in the clip I would then be able to display a high resolution image. And that is my idea of a Smartpen. This display together with a Bluetooth module that connects to your Smartphone would then create the Smartpen that could show you new messages, emails, etc. As you can imagine, embedding almost 200 LEDs that are individually addressable into a pen as well as a pixel density of 101 PPI is quite challenging. This post will describe how I addressed these challenges. Please note that my Smartpen is more a proof-of-concept than a usable device. Several issues together with a lack of time had stopped me from finishing the project. At the end of this post I will explain in more detail these issues. I explored many options for the type of LEDs in this project. It was quite clear from the beginning that 200 discrete LEDs are not an option due to limited space. 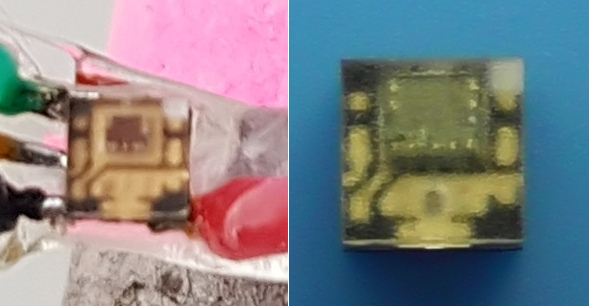 Also, the standard “smart LED” WS2812 with its 5x5mm footprint is way too big for this project. In addition to that, the chip of the WS2812 uses a single-wire protocol that is more complicated to use than SPI and is also much slower to update. Update speed is quite crucial in this project. With an image width of 128px and an update rate of 15fps, each LED would need to be updated at a rate of 2kHz. After a bit of searching I was quite happy to find the APA102-2020. 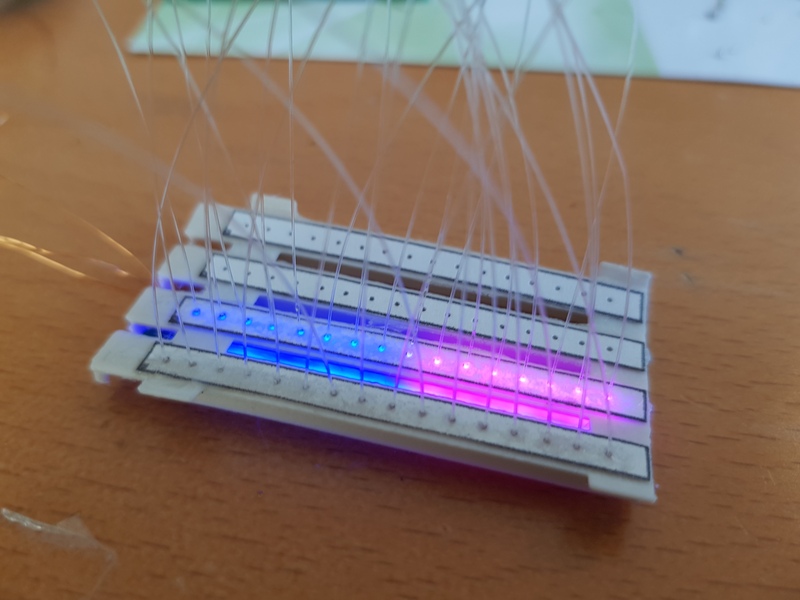 This RGB LED comes in a tiny 2x2mm package and has a normal SPI bus. So it was perfect for my application. That’s why I’ve bought a couple of hundreds of them. As you can see, the LED shows a dotted line instead of a solid one. And the dot pattern is exactly the PWM pattern. This is of course very annoying because if would mean that the display will have this dot pattern for all color values that are not 0xff. In the “hearts” image you can see a typical problem of POV displays: The spacing between the individual dots due to the spacing of the individual LEDs. Because of that, POV displays have typically this “lineish” appearance – not very pretty. The next section describes how I fixed this. So, how can you fit 64 LEDs of size 2mm into the clip of a pen that is only 30mm long? And how do you avoid this “lineish” appearance of POV displays? The answer is simple: Fiber optics! Fiber optics take the light of the LEDs and route it through the pen to the clip. On the clip, each of the tiny 250um fiber optics is one dot of the display. If you look closely at the picture above, you can see the fibers in the center of the clip glowing. 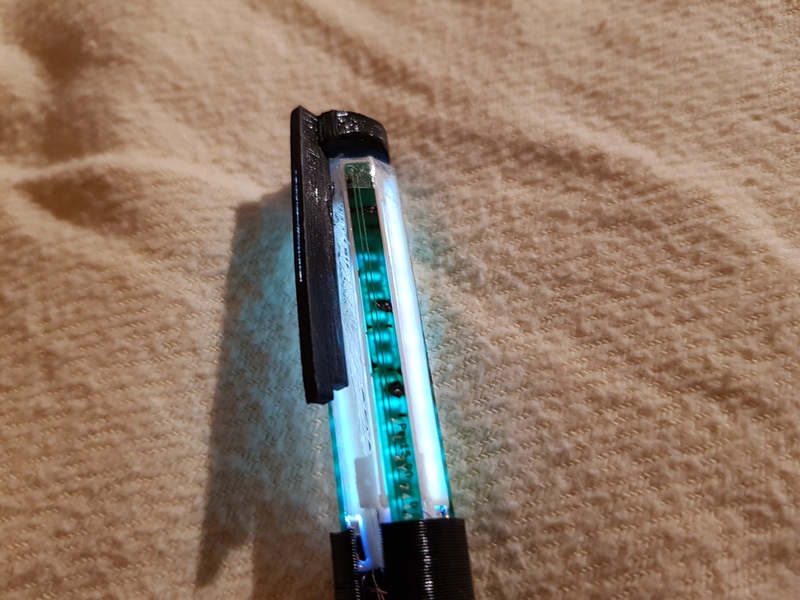 If you look closely you can see that the LEDs and the fibers on the clip are not in the same order. I tried several times to align the fibers in the right order at the clip but I always failed. Since you have to move the fibers very close together they have a tendency of jumping over other fibers and screwing up the order. Therefore I just glued them in, ignoring the order and sorted things out by reordering them in software. The last bit needed to use the display unit as a POV display is a way to determine the position of the clip. For this purpose, I used a MPU6050 IMU. You can see the IMU on a breakout board glued onto the pen in the first picture of this post. Actually, the 6 axis IMU is a bit overkill. For the display application I only used one axis of the gyroscope. While wiggling the pen between your fingers you can easily detect the turning points by looking at high angular accelerations. All the software needs to do is to start displaying the image column by column when it detected the left turning point. Upon the detection of the right turning point the image is displayed in reverse order, again column by column. I implemented the software on a Raspi since this allows for much faster development compared to a microcontroller. 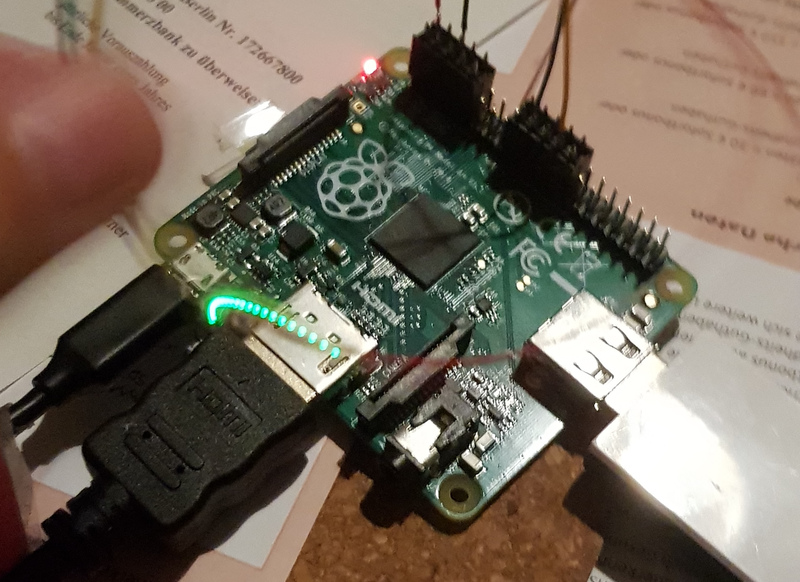 All you need to do is to connect the IMU to the I2C bus and the display unit to the SPI bus of the Raspi. I created the images to display on the pen using Gimp and exported them as C header (yes, Gimp can do this directly, a very handy feature!). Please note that the repository contains a later version of the mechanics compared to the pictures of this post. 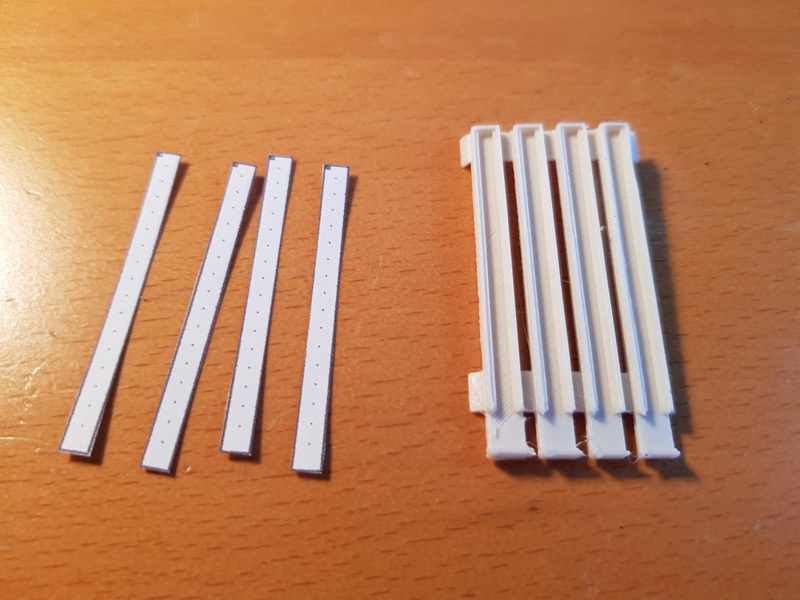 In the new version, the LED PCB holders are split into two parts (one holding the PCB, one holding the fibers) that are to be glued together. The motivation for this was to be able to polish the fibers after gluing them in for having a more consistent brightness between individual fibers. Like mentioned above, the PWM frequency of the APA102-2020 is too low for this application. You can see this especially on the eggplant image above. The body of the original eggplant is filled with a solid color. Since this color is different from 0xff, we get this strange dotted pattern – not very nice. There are basically only two ways around this: Either limit yourself to 8 colors (using either 0x00 or 0xff per channel) or use different LEDs. Like mentioned before, there are (most likely earlier) variants of the APA102-2020 that do not have this PWM issue. However, I was unable to obtain them. I ordered my LEDs from Digikey and Adafruit and received always the flawed LEDs. Crosstalk happens because the light of a LED is forwarded by one of its neighbor fibers. You can see the effect also in the eggplant image, especially at the font. The “shadow” effect seen at the bottom comes from crosstalk. Working around this issue should not be too hard. In fact, the hardware files that are in the latest revision of the projects repository should already help a lot. Instead of white flexible filament they use normal black PLA. This should remove much of the crosstalk created by translucence and reflectivity of white PLA. Keeping the brightness constant between the fibers is quite tricky. You can see the effect in the font of the eggplant image. Some lines are brighter than others. For getting the brightness right, the placement (in all 3 axes) relative to the LED as well as the orientation of two of the angles of the fiber needs to quite good. Also, the end of the fiber needs to be polished so that you get equal light transmission. 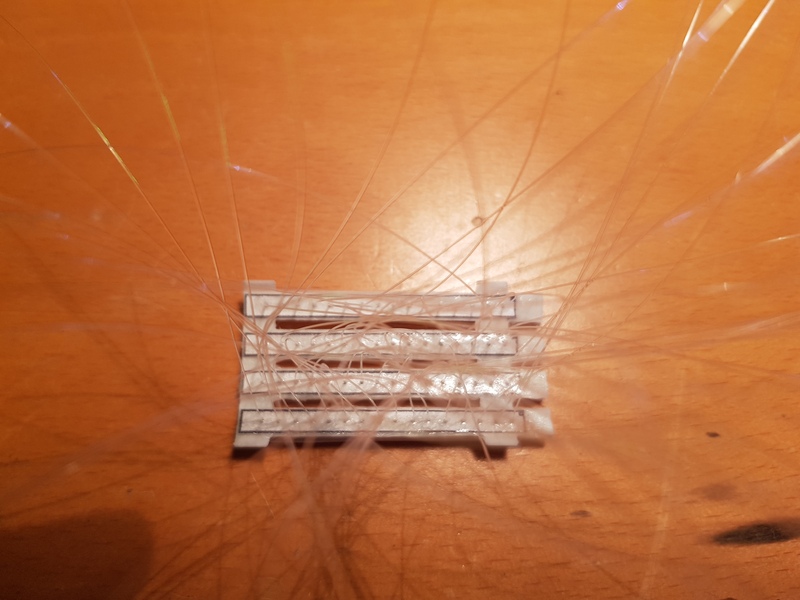 I think (especially with the latest hardware revision that allows to polish the fibers after they are glued in) this issue is solvable… but tedious. Do not underestimate the heat that is generated by 200 LEDs! I learned this the hard way. Appareantly, the LEDs do not have a proper reset circuit. So when they are powered on, the LEDs show random values. I once turned the system on without starting the software (that resets them) and left it running for a couple of minutes. The result was that by 3D printed parts were molten. Obviously, a Smartpen without any way of communication wouldn’t be that smart. It could maybe show the time but that would be it. Therefore, my plan was to use a Bluetooth Low Energy SOC like the Nordic nRF51822. Using BLE could allow the pen to stay paired with a smartphone for years on a single battery. A nice addition of the Smartpen would be a way to add interaction. Simple interaction might be realized by using the IMU to send basic commands. However, more complex interactions might need more powerful approaches. Once you are able to recognize written characters, you could use that power also as a way for interaction. You could use for example arrows to navigate through menues. The intention behind this post was to share my idea of a Smartpen and communicate my approach to it, including the difficulties I faced. Like I said before, there is still a lot of work to be done until it is a useful device. I hope very much that someone will pick up the project from here on. In case you have any additional questions, please drop a comment here and I will try to answer them. This post describes how to add a wireless UART transmitter to STM32 microcontrollers. This works with zero additional parts since the RF signal is generated directly by the STM32. Also, a fitting receiver realized with a RTL software defined radio is shown. Currently I am working on a project that is very constrained in terms of physical size and cost. In that project I need to send the temperature wirelessly over a short distance. My normal approach would be to use something like a nRF24L01 together with a microcontroller and temperature sensor. However, this is not possible since there was neither the space nor the “money” for that solution. Microcontrollers combined with radios were also not possible due to their price. Therefore I thought about alternatives and found this: http://mightydevices.com/?p=164 . In that post the author used a STM32 to transmit Morse codes to a FM radio. Since in this approach the STM sends at 100MHz the question if it is legal is easy to answer… But I liked the general idea. Just route the STMs PLL to the MCO output, attach a wire to it and you are done with your transmitter. I used the very same idea but tweaked the output frequency to 27MHz, which is an ISM band (so it is legal to send there). Instead of sending audio I simply send data like on a serial port using ASQ modulation (meaning: a one bit turns the transmitter on, a zero bit turns it off), hence the name of the project is WUART (wireless UART). I implemented a simple software that reads the internal temperature sensor of the STM32 as well as VDD and prints these numbers in a human readable format over the WUART twice a second. The code is designed to run on a STM32F051R8 (like on the STM32F0 discovery board) and outputs a frequency that is 4 times that of the HSE’s frequency. So ideally, the HSE clock should be 6.75MHz to achieve a transmission at 27MHz. Please note that we are outputting a square signal onto the MCO pin. This means that we will create lots of harmonics. It is advised to only use this in a shielded environment. As a receiver any RTL SDR USB dongle can be used that supports the reception of the frequency that is transmitted by the STM32 (check https://www.rtl-sdr.com/about-rtl-sdr/ for models and their frequency ranges). The stream of bits that falls out of the GNU radio schematic still needs to be “framed” into bytes. For this purpose, the repository of this project also contains a framing software in the subdirectory “dec”. The dec software receives the oversampled raw bits from GNU radio via STDIN (so GNU radio and dec can be piped together) and transforms them into actual payload bits. This works simply by sampling the raw bit that is expected to be in the center of a payload bit. The payload bits are then grouped into bytes and outputted to STDOUT. To run everything, simply pipe the python file generated by GRC into the dec program. If everything works as expected, you should see the temperature and voltage measurement strings at the output of your terminal. Please note that the GNU radio program might need some adaptions regarding the frequency and thresholding. It therefore also includes debugging tools to tap into the intermediate results. 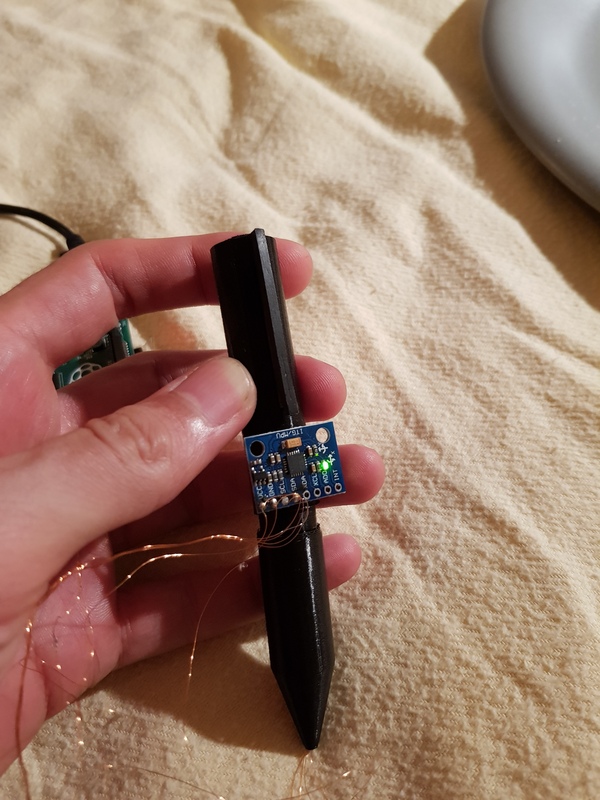 This post describes my modification of a TS100 soldering iron that transforms it into an oscilloscope. The changes are mostly made in software. Right now, the user interface is very minimalistic. The vertical axis can be scaled simply by pressing and holding one of the buttons and then turning the iron around its axis. In the same manner the horizontal axis can be scaled by tilting the iron up and down. Using this as the main interface makes the oscilloscope surprisingly usable. Of course, the iron can be used as a normal iron or as an oscilloscope without any changes to the hardware. The oscilloscope is simply a new menu option. Even without any changes the TS100 is a very nice portable soldering iron. I use it as my main soldering tool. But what makes it special is that it contains a powerful 32 bit ARM processor, a graphical OLED display, open source firmware and a schematic that is available. And this makes it a very good target for this project. Using this direct connection is rather dangerous because every voltage on the tip directly reaches the ADC input pin of the ARM. For a real-world use-case I would recommend to add a resistor in series and a TVS protection diode before the ADC pin. Since I’ve added no front end analog circuit to the soldering iron, it is limited to what the ADC of the ARM is able to measure: 0 to +3.3V. This is of course very poor for an oscilloscope. A cheap modification would be to add also a resistor divider in front of the ADC for being able to measure higher voltages. A 10:1 divider should be a good compromise. It allows you to measure up to 33V. Also, since the ADC has a resolution of 12 bit you should still have a sufficient resolution of 8mV/LSB. Do NOT use it on your production soldering iron. Currently, it does not let you use the soldering iron and the oscilloscope code is nothing but horribly wrong. Why did I start with such a crappy implementation? Well, it was thought of as a demonstrator to check if the idea is viable. Unfortunately, the original firmware would require rewrites of large portions of it to support high frequency ADC sampling and I am not really in the mood of investing so much effort in a code basis of questionable quality. Instead, I will start a clean room implementation of the firmware. This will then also use the new UI interactions that I have demoed for the oscilloscope. For example, all the values like target temperature will be simply settable by pressing and holding a button while turning the iron. Turning in one direction will increase the temperature, turning it to the other direction will decrease it. Also, forwarding the oscilloscope data over USB is an option. This would allow to display the measurements on your Android device for example. A simple multimeter will of course also be added. 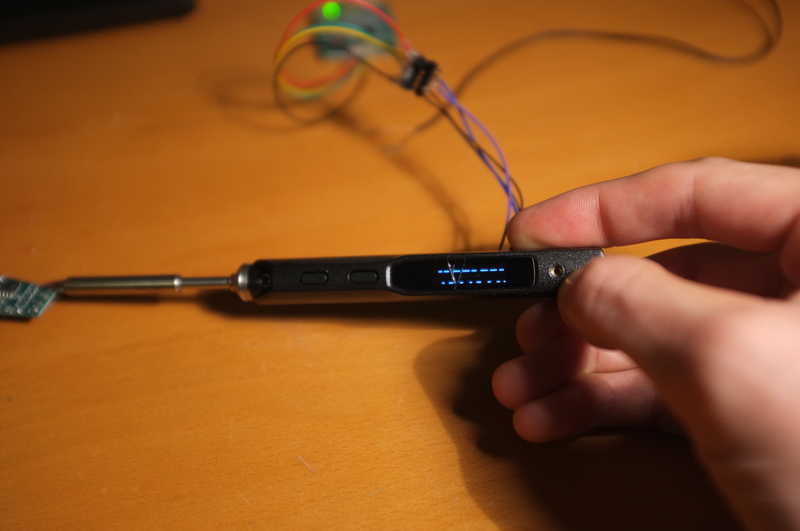 In this post I’ve shown you a demonstrator of a soldering iron turned into an oscilloscope. The obvious question for this project is of course: Why?? Is there a signal at all? Does the timing of the look sensible? Does the voltage look sensible? Normally, the 3.3V I2C bus shouldn’t idle at 1.2V!? Did I forget to enable the pullup resistors? Why is there no ACK bit from the I2C device? Am I sending data to the correct address? Once there is a usable alpha version of the rewritten firmware available I will publish a link to it in my blog. Please subscribe if you want to be notified about this. I have a small timeslot until my new year’s eve party begins so I thought I could use it to upload the newest Wifibroadcast RPI FPV image: https://github.com/befinitiv/rpi_wifibroadcast_image_builder/releases/tag/v0.4. Merged TX and RX images. You can write this image file onto the SD cards for both RX and TX Raspberries. The devices change their roles accordingly depending on whether a camera is connected or not. In short: Raspberry with camera behaves like a TX device, Raspberry without camera behaves like a RX device. Removed message flood of TX to systemd journal to avoid growth of log files. This allows for long running TX devices. The most important change is point 1: This means for you that you only have to download one image instead of two. Also, there is no need to mark the SD cards with TX and RX since they are all the same. This makes things much easier. Update 12/13/2015: Some people asked for example videos. Unfortunately, I only have a single set of data that I cannot publish here. If someone would like to see results of this script and provide me with data (of course with several images per day so that there is something to select from) I would process it and present it here. Most people that have created an outdoor time-lapse video will have encountered the problem of flashing video due to sunny images followed by cloudy images or vice versa. One common way to get around this problem is to shoot more than one image per day and then select the best fitting images. But this can be quite a lot of work. If you shoot a picture each 30m you’ll end up with close to 20,000 images per year. And that would take you a while to select the right images. Therefore, I wrote a simple script that selects one image per day that fits “best” to the day before. The script then continues to the next day and finds the “best” compared to the “best” of the previous day. The obvious question is now: What is the “best” image? As said before, it should contain as little change in brightness as possible. Also, the change in color should be not so big. I used quite a hacky approach that is far from being optimal but works well enough for me. I create the sum of absolute differences (SAD) over all pixels for the reference image compared to the candidate images. The SAD just subtracts all pixels of the reference picture from the candidate pictures. This absolute value of this difference image is then summed together to end up with a single score of similarity. The picture pair with the smallest score is considered to be most similar. This SAD is created for all three color channels separately to also get some simple kind of color comparison into the process. Ideally, these effects should not have a big influence on the similarity scoring. Therefore, I low-pass filter the images (aka blur) before comparing them. This averaging removes noise as well as small movements. Still, the overall appearance like brightness and color is maintained. You’ll find the code here. Now the script will run through the pictures in the folder “motion” and create symbolic links to fitting images in the folder “sel”. You might want to adapt the parameters inside the script like the number of images per day and the start image of the first day. The newest Wifibroadcast RPI FPV images are now available under https://github.com/befinitiv/rpi_wifibroadcast_image_builder/releases/tag/v0.3. Support for 5GHz cards like CSL-300 and TP-LINK TL-WDN3200. The images automatically detect the type of WIFI card (2.4GHz or 5GHz) and configure them appropriately. Fixes “Trouble injecting” bug. This occurred for some people on tx side, mostly on 5GHz hardware. Special thanks to Alexandre, Kieran and André who made this release possible with their support!